Scarmado Cattle Company is located in Caldwell, Texas and is a complex cattle order buying business that operates around the clock. Working Monday through Saturday, cattle buyers attend local cattle auctions bidding on stockers and feeders to fill specific orders for as many as 20 customers a day from the southern states to the Midwest. Scarmardo Cattle Company’s niche is finding the right cattle for their customers. To do that, they visit more than 80 livestock auctions a week throughout Texas, working cattle sales in Louisiana and Arkansas too, if that means filing a specific order. 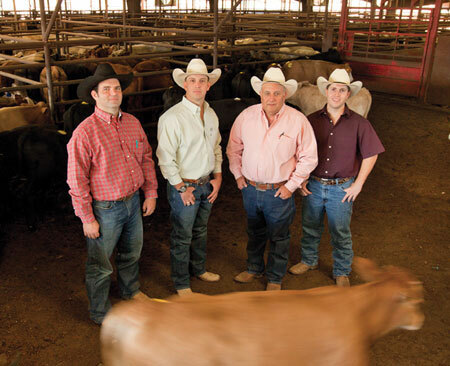 Being centrally located in Texas allows Scarmardo Cattle Company to keep the cattle they buy fresh and healthy by spending a limited amount of time in transit. Whatever your cattle needs, from little calves or packers cows, let Scarmardo Cattle help you find the fit that is right for you. Pete has been dealing with cattle for more than 40 years and raising stocker cattle almost as long. Upon graduating from high school, Pete was determined to set up his own cattle operation. Growing up on a farm in the Brazos Valley, he enjoyed working with the few cattle his dad owned. In 1975 he leased his first set of cattle pens and three years later bought his own land near Caldwell and built his own pens. Together with his wife, Jo, and their three sons, Scott, Craig, and Ty, they run a diversified family business that includes many other agribusiness operations. Watch The American Rancher feature on Scarmardo Cattle on RFD-TV.